Are you looking for a Joomla template maker? Joomla 1.6 was released recently and if you want a professional template for it you will either have to download a free template from ThemeGoat, or try to learn coding a template which can take months or buy a template generator software like Artisteer. I decided to review this wonderful software, because at this time it is the only template making software that supports Joomla 1.6. Check out the video to see how Artisteer works. I have also started making templates by buying Artisteer first. It was well worth the investment. I’ve creater over 50 templates with it for me and for other website. Just imagine, that if you sell an Artisteer created template for, say $30 ,you will have back your initial investment in no time. 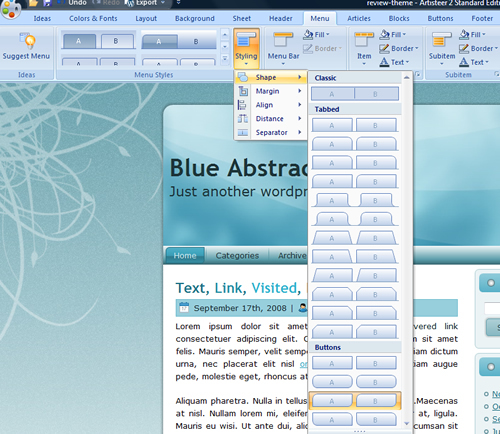 Atisteer works similarly to Microsoft Power Point. You have newbie friendly options to select the color, style, fonts, headings, footer, size, image and much much more. Even if you are new to such programs, you will find it very easy to create that you want. You even have the option called “Suggest Design” which randomly picks a color scheme, fonts, styles for you. You can literary create a Joomla 1.6 template with the push of a button. Artisteer has two editions: Home and Academic edition ($49.95) and Standard edition ($129.95) – there is no discount or coupon code. The Home and Academic editions supports xHtml, WordPress and Blogger. The standard edition supports xHtml, WordPress, Blogger, Joomla 1.5, Joomla 1.6, Drupal 5, Drupal 6, Drupal 7, DotNetNuke and ASP net and you can also export your project into CodeChargeStudio. As you see the Standard edition is a lot better value and it’s the only edition that supports Joomla. You will see wordpress and joomla theme example on this website (check the older templates). Artisteer accepts Paypal and all major Credit cards. They also accept other payment methods, like Bank Wire, if you contact them. I haven’t created any Joomla 1.6 templates with Artisteer yet, but with Joomla 1.5 and WordPress it worked like a charm. I never had any issues with it, it was always stable and the software updated were also quite frequent. My overall experience with Artisteer is awesome and I really recommend it. 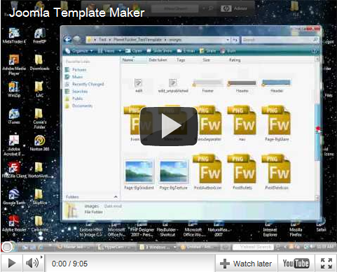 I recommend Artisteer if you are looking for a Joomla 1,5 or Joomla 1.6 template maker software. I have tested it myself (version 2) and worked with it for months. The price is acceptable and worth it. Even if you are an advanced template creator you will find enough options that will make your template more special and if you are new to templates, Artisteer will help you with its newbie friendly interface and “Suggest Design” feature. Leave a comment if you tried Artisteer. I am also using Artisteer to build websites. So far so good. I like it. The issue is sub-templating in K2 with the Artisteer templates. I am designing a couple of websites using Joomla & K2. Currently on localhost. I am using several templates I designed in Artisteer — the idea was to get away from modifying css, etc. I have tried various ways of sub-templating (Simon and other cut & paste ways) and they don’t seem to work. Probably because each template is a complete package with images, etc. Have you figured out a way of sub-templating with the Artisteer templates so that the various templates are accessible from the K2 item template drop-down list? Sorry I have never used K2. I don’t think K2 is compatible with artisteer created template. The two are different packages and are not designed to work with each other. Maybe it works for somebody else? As said I’ve never used K2. I also using artisteer it is very best software. How do you add the paramaters to your Artisteer templates. For now it is for personal use but I am considering building some for sale. Thanks themeegoat. This is exactly the software I was looking for. Many features and veeeery simple to use!!!!!! It has not made Joomla 1.6 templates. I can vouch for this. It simply doesn’t export properly, or offer the choice to choose between 1.5 or 1.6. Be careful of the overly-keen hyperbole of this article. I starting using Artisteer not too long ago with no real knowledge of design. It’s a fairly simple and intuative program that lets you create a nice Joomla template step by step.